Scrappy Mom's Sneak Peaks & Blog Roll!! 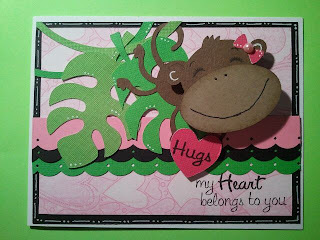 Since today is the "final" day of the Scrappy Mom's Love Notes Sneak Peaks, I thought I'd finally post the project I made for this weeks Scrappy Mom's challenge. (incase you didn't check out the scrappy moms page). Hope you guys enjoyed the card!!! Now, Onto our BLOG ROLL from Momo's Awesome UStream Live class last night! 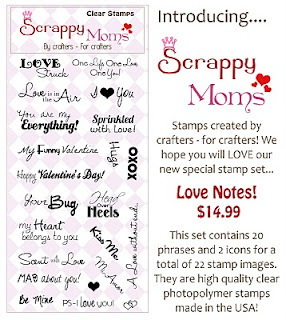 As most of you already know, this week is Scrappy Mom's Sneak Peak for their new stamp set Love Notes. 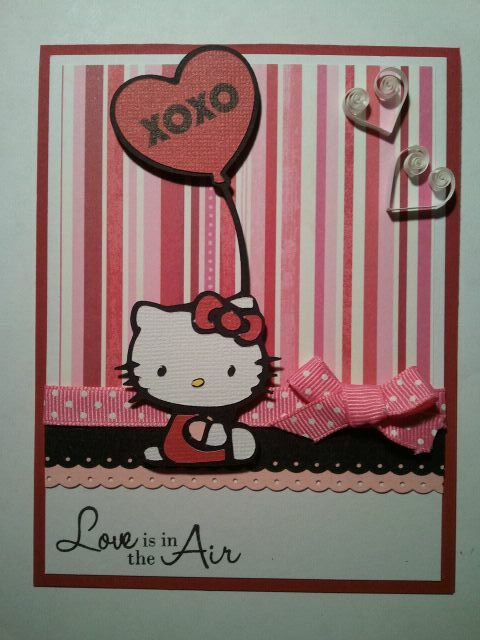 They are the perfect set for Valentine's Day and Cards for your loved ones. 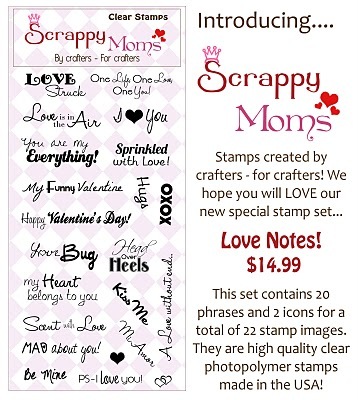 Be sure to head to their blog at Scrappy Moms Stamps to pre-order your set today! I hope that you all are having a great weekend!! If you are not aware, Scrappy-Mom's has put out another FANTASTIC set of stamps and I'm currently in the process of creating for this week's sneak peaks! I know, I'm 2 days late of the start day but better late than never, right?!?! LOL Be sure to check out all of the fantastic designers projects by clicking on their name on my right side bar! GOOD NEWS!! My Office has FINALLY moved to our new locations!!! WAHOOO...now I only have a 1/2 hour drive! Thank goodness! So I should be posting more soon!!! Anyways....for those who didn't know, last Sunday was my birthday! I'm soooo stinkin' old! lol. We'll I woke up on Sunday to the greatest birthday preset--An Email From Madison's Mom!!!!! If you were one of the great people who created cards and sent gifts this is for you!!! Hope you guys enjoy it, I know I was certainly touched by it! I didn’t forget about you. Life has been hectic. Thank you, thank you, thank you for the ingenuously adorned cards. When Madison saw the boxes roll in and the numerous cards and gifts pour out, she smiled. It may not seem like much, but when our child was in such pain that she couldn’t conjure up a mire grin in weeks, this statement takes on a whole new meaning. We were all (including Uncle Pete and Daddy) simply amazed at the amount of time, effort and creativity that was heartwarmingly placed into each and every card. For a while, we used the cards as a distraction for Madison. At the time the chemo drug she was taking was making her anxious and thus nauseous. Each day, following the pills, we would pull out a pile of cards and read them to her to help her forget her worries. We would even take to the map to pinpoint where the cards originated. Trisha, we are grateful that you coordinated such a thoughtful gift. 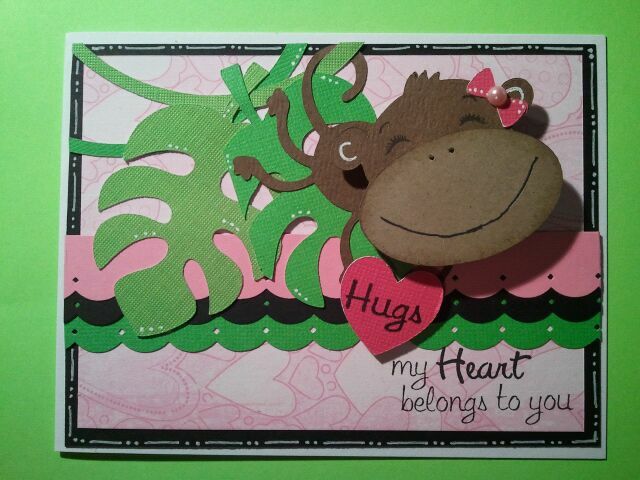 We are thankful for all your scrapbook friends who gave so much of themselves to make Maddie smile. Bob and I will never forget your kind and generous efforts. 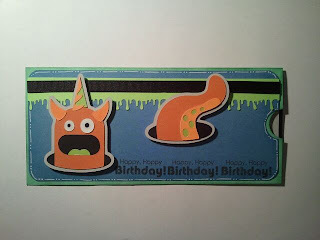 It's My Party Blog Hop! You should have just arrived from the oh so talented Tracey from CraftJunkieToo's Blog, however, if your just starting our with me you'll want to start our fabulous host, Alex's Blog. So normally I lean to a more...how should I put this...Girly projects? LOL But tonight I was totally in a boy mood and decided to create a Birthday Card for a Special Birthday Boy. 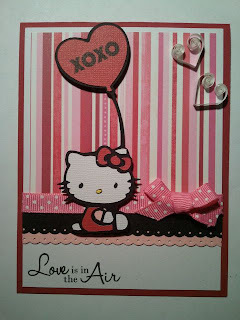 I must warn you that my card is OH SO simple BUT what crafter doesn't like an easy card to whip up in those last minutes??? I know I sure do! 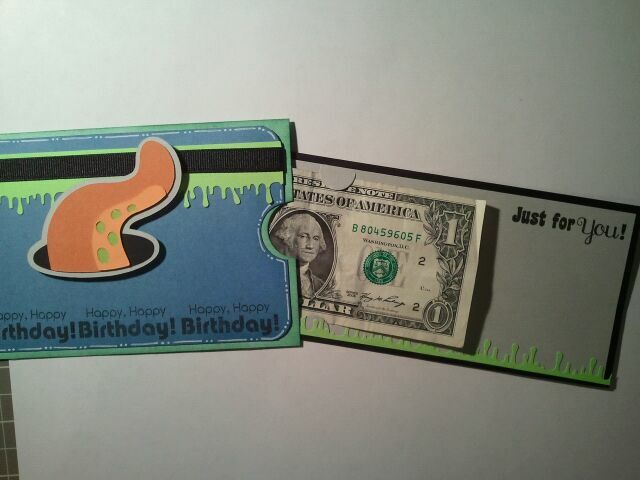 My Card measures 8.75" x 4" and will find in a letter size envelope, which almost everyone has in their home! 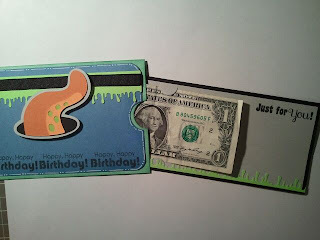 I also left space on the pull out tag to add a little note to the birthday boy and include some cash. Tips & Tricks with Trish for making a party successful:﻿ Use your creative side to come up with an invitation and use that theme throughout the whole party, such as decorations, goodie bags, maybe even the cake! Having a them makes everything so much easier to coordinate! Also, Don't forget! There are not 1 but 2 grand prizes that will be award to a follower who comments on ALL the posts....so be sure to enter in for GREAT PRIZES!! Since I'm the last one on the blog hop trail, be sure to check out our Its My Party Blog Hop Facebook Page for all the other great things going on today along with the hop, like a USTREAM Broadcast!! !